A tree can be the most impressive part of your yard or landscaping. Wilson's Natural Landscaping is built of a strong team of plant professionals. 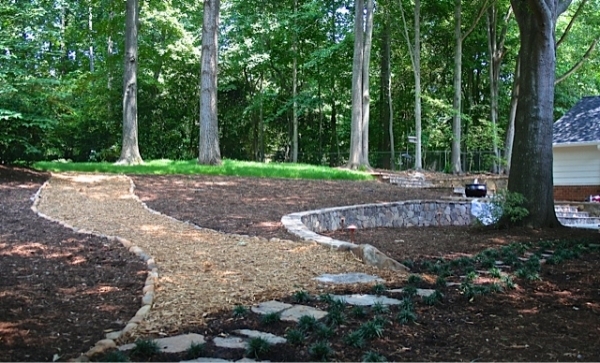 When you're looking for a landscape that not only follows Mother Nature's design, but improves upon it - call Wilson's. Our gardening methods are ecologically correct, but it doesn't mean that your garden will become overgrown with weeds or unwanted plants. Our team of plant and tree experts will be able to determine the style and features you want in your garden or trees before designing your custom landscape. We have over 25 years of experience with picking out and planting the best trees for our clients. Our team of tree experts know how to best analyze your yard and pick a tree (or trees) that will best meet your needs. Whether you're looking for some shade, a landscaping accent, or a natural privacy fence - Wilson's Natural Landscaping is here to help you with your trees. We're passionate about continuing what Mother Nature started! Trees come in many varieties, and serve a large array of purposes - from providing privacy screening to adding desired shade on your property. Trees are simply the best solution for an immediate transformation of your landscape, and can be a beautiful focal point for many different design concepts. Here at Wilson's Natural Landscaping, we have trained professionals who can plant your trees properly. For as large and massive as trees can be, they're delicate living organisms and go through many shocks throughout the planting and transplanting processes. Lucky for you and your trees, our team has the knowledge and skills to safely handle your investment and plant it perfectly. Planting large trees can be intimidating. Wilson's Natural Landscaping takes the guesswork out of what trees to plant and where to plant them. Large trees can add immediate, effective, and natural protection for your property. If you don't know what trees should be planted in your space - that's not a problem! We have the knowledge to decide which large tree species would serve you best, from the native, festive, and classic Holly to the mighty and lush Arborvitae. We'll happily provide a professional consultation and installation that meets your needs! "We purchased a home with a mature, overgrown Landscape. Chad paid a visit to our garden and my husband and I spent an hour or so conveying our thoughts. Chad quickly came up with a plan that was executable and that paid respect to the existing vegetation. Wilson's provided professional pruning, feedings, a few removals and some great, quality planting additions. Now, with Chad and the team managing the plantings monthly we have a truly lovely garden to enjoy and share with our friends!!" "We met Chad through a mutual friend. Our infant had just been born and her bedroom was in an area of the home that got very hot due to the summer sun blazing through the windows. Chad and Mike came out and installed 3 lovely, LARGE maple trees that now provide the room with shade. As a bonus our daughter gets "live in the trees" as she looks out her bedroom window! These guys know their trees!" Contact Wilson's Natural Landscaping today to speak with a plant management specialist in Huntersville. We'd love to hear from you and help you get your yard looking beautiful! Send us a message or give us a call at (704) 888-4635.